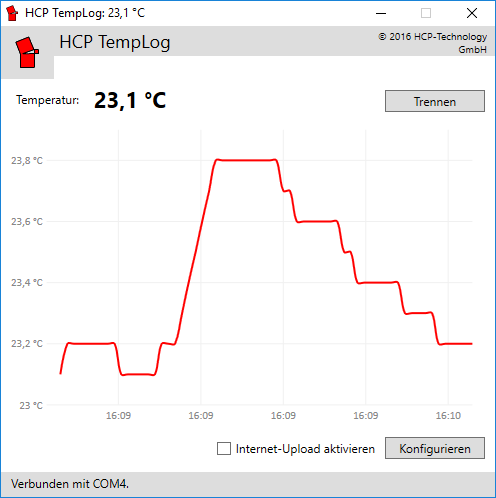 HCP TempLog saves your temperature data on the internet – accessible anytime. How does HCP TempLog work? The Bluetooth module has an integrated temperature sensor. It will always send the most recent temperature data to the computer or the smart phone. data. The Windows software or Android app transmits the data to the internet. The internet database receives the temperature data. The data is stored and displayed in graphics form. Switch on the Bluetooth module. Download and start the Windows software. Follow the instructions to set up the temperature sensor. If you don’t want to use the online upload, the setup is now complete. we will then provide you with two identifiers: your ID and your password. Start internet upload box and click on Configure. Now enter the ID and the password you got in step 3. Confirm the settings by clicking on Apply. click the Configure button again to check if you have entered the correct ID and password. The Windows software will now save the temperature in the online database every minute. Click here to open the database login. Enter the ID and the password you got in step 3 and click on Sign in. You should get a temperature curve (data collection may take a few minutes). You have now successfully set up HCP TempLog! To set up data receiving via Android app, follow the Android app instructions. By pressing the button to the left of the home button and selecting the Settings you can enter your ID and password you got in step 3. The upload of temperature data begins when your smart phone is connected to the internet and to the Bluetooth module. 1. Start the EXE file. 2. If necessary, install the .NET Framework 4 Client Profile. 3. Switch on the Bluetooth module. 4. Follow the instructions to set up the temperature sensor. The software does not start? Install .NET Framework 4 and Update 4.0.3. 2. Activate the Bluetooth module. 3. Go to the smart phone’s Bluetooth settings. 4. Start the device search. 5. Connect the Serial Adaptor device with code 1234.